Easy Hi-Q Recorder 2.2 is audio file recorders software developed by Roemer Software. Easy Hi-Q Recorder is the easiest way to record absolutely any sound in real-time! Easy enough for beginners, yet loaded with powerful features for advanced users. Record directly to MP3, CBR, VBR, WMA 9, WAV, OGG, 48 kHz Pro Quality to 8 kHz mono. Record Internet streaming broadcasts or music from Windows MP, RealOne, etc. Record LP's, tapes, mic, etc. Auto: song, silence detection, file splitting. Has a VCR-like timer! Has a player. 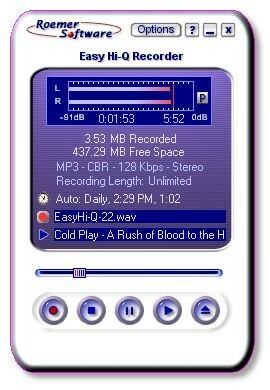 This audio & multimedia software is shareware, which means you can download and use Easy Hi-Q Recorder 2.2 for free during the trial period (usually for 30 days). At the expiration of the period you will have to buy the audio file recorders product for $29.95. Easy Hi-Q Recorder 2.2 is available at regnow and Roemer Software website. Easy Hi-Q Recorder 2.2 supports different languages (including English). It works with Windows 98/XP/Vista. Latest Easy Hi-Q Recorder 2.2 does not contain any spyware and/or advertise modules, allowing installing it with no worries concerning valuable information loss. We has completely tested audio file recorders software Easy Hi-Q Recorder 2.2 many times, written and published the interesting article and uploaded installation file (7298K) to our fast server. Downloading Easy Hi-Q Recorder 2.2 will take minute if you use fast ADSL connection.